It is not until the mid-seventeenth century century that other Exeter booksellers began regularly to emulate Coeffin in having books printed on their behalf in London. 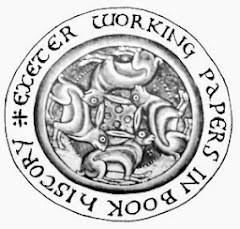 Although there are records of successors in the mid-sixteenth century, it is not until 1573/4 that there is evidence of a continuous booktrade presence in Exeter. At that date Peter Benson, who learned his trade in London, was admitted freeman of Exeter and founded an artisan dynasty which survived for several generations. The three main book trade dynasties in 17th century Exeter will be examined later. Another Exeter bookseller who appeared to have learned his trade in London was Christopher Hunt. He was made a freeman of Exeter in 1593 and had two titles printed for him in London by Adam Islip, both of them translations by Richard Carew. In 1594 he published Examen de ingenios: the examination of men's wits by John Huarte, and Godfrey of Bulliogne, or the recouerie of Hierusalem by Torquato Tasso. Both were thick quarto volumes, the first of 333 pages and the second of 119 leaves. Hunt appears to be the first Exeter bookseller since Coeffin to have his name on imprints in this way, but he was not imitated until the 1630s and 1640s when Edward Dight and his former apprentice Thomas Hunt the son of Christopher published a series of religious tracts which were printed for them in London. At the end of the sixteenth century Michael Harte appears to have run a large and successful business in Exeter. He was the son of John Harte, shoemaker of Exeter but left his native city to learn his trade, being appenticed to John Windet, citizen and stationer of London on 29 September 1585 and turned over to Andrew Maunsell and then to Robert Dexter when he succeeded Maunsell at the Brazen Serpent in about 1590. He became a freeman of the Stationers' Company on 5 October 1592 and his name appears in the imprint of George Gifford's Dialogue concerning witches and witchcraft. He left London soon after to return to Exeter where he became a freeman by succession on 31 December 1593, operating as a bookseller in the parish of St Martin until his death twenty years later. We are fortunate in having his inventory, one of only thirteen known for booksellers in English provincial towns outside Oxford and Cambridge during the seventeenth century. It was taken by his former apprentice John Moungwell and two others on 9 December 1615. Unfortunately the three assessors soon lost interest in listing individual volumes but it can be estimated that his total stock amounted to some 4,500 volumes with a total value of £103 8s 2d, 71 per cent of the total value of the inventory. About 2,500 volumes were stored in the shop with the most valuable items in the hall and less valuable stock in a warehouse. Harte also undertook bookbinding and his equipment, worth 12s 2d was stored in the shop. From those volumes individually named it would appear that Harte had a wide-ranging and up-to-date stock. Editions of about two thirds of the titles that can be identified had appeared in the five years before Harte's death. Over that period only about 2,331 titles are recorded in the Short-title catalogue so, even allowing for some duplication, Harte would have had a useful stock. There is a little evidence of foreign editions, such as Galen, a Hebrew Bible and a parcel of French books. There are also enties referring to old books, so Harte may have had an antiquarian side to his business. Religious works figure large with prayerbooks, psalms and commentaries on the Bible. Schoolbooks both old and new are also prominent. There is a keen interest in other countries, with histories of Spain, France and Venice. A French dictionary is listed as well as translations of the Essays of Montaigne and The French academy of Pierre la Primaudaye. Significantly Thomas Blundeville's Exercises are listed, the second part of which contains a description of Mercator's globes and Drake's circumnavigation. There are many interesting comparisons that can be drawn with the inventory of a York bookseller, John Foster, which was drawn up a year later, and there is some indication that, while coverage was broadly similar, Harte, with his interest in foreign material, could be catering for the special interests of what was then a significant port. (Maxted 1996).